Well here it is. 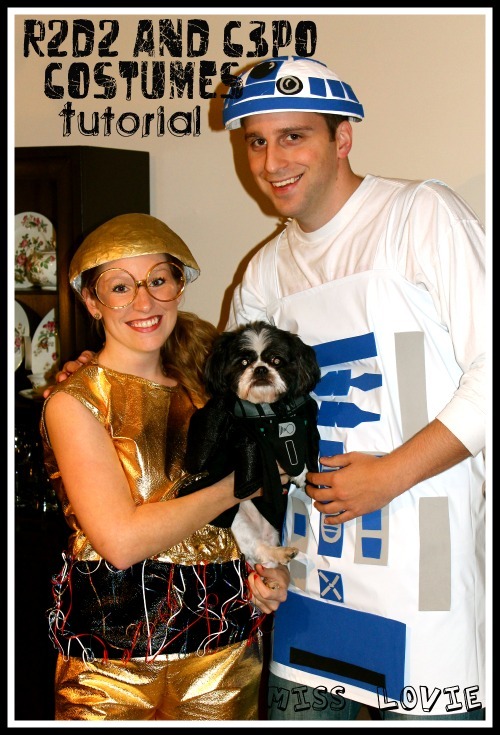 Not that anybody's banging down my door to get this tutorial or anything, but I thought I'd put it out there in case there are some other Star Wars nerds (besides Mr. Lovie and me) that have been dying to know how to make R2D2 and C3PO costumes. 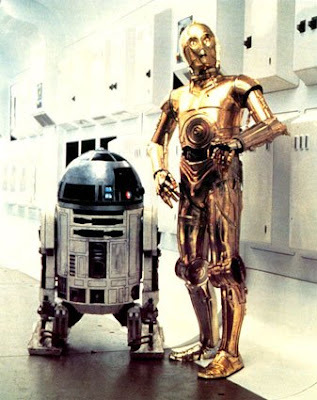 Below you will find the picture that sold us on the idea of being the droids from the beloved Star Wars films. How funny right?! As soon as we saw it, Matt said, "Oh, it's on." I love that they went with the less obvious choice of having the male as R2 and the female as 3PO. And their baby is cute as Leia. I'm sure our dog, Nix, would have made a great Leia, too, but Darth Vador was much funnier. 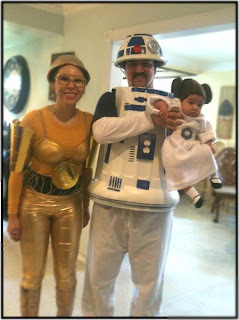 For R2D2's costume and for the helmets, I got my inspiration from this awesome R2D2 tutorial on Instructables. I made the helmets just like she instructs in the tutorial. 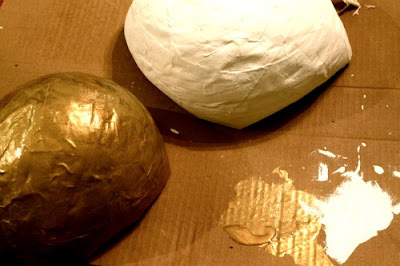 I used Recipe Option 2 from here for the papier mache and let it dry for 48 hours, I believe. You could use a hair drier (set on cool) to dry it if you needed it quicker. Pop the balloons to get the helmet shape. 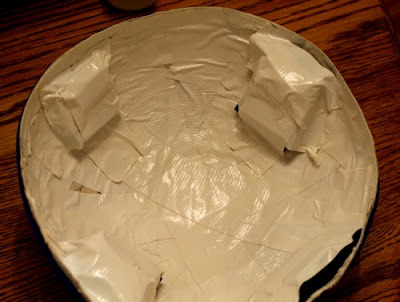 Paint the helmet with 2 coats of acrylic paint. For extra stability, place duct tape on the inside vertically and horizontally (as seen in the picture below) for added support. This is optional and may even be unnecessary, but I did it just in case. Matt's helmet was too big (mostly because he made me make it bigger because he was afraid it wouldn't fit) so he improvised to make it fit by duct taping several squares of craft foam stacked on top of each other inside on the sides and front and back. See above. So if your helmet is too big, no worries, you can still make it fit. I did not do this to mine, but it was still loose so it moved around a lot during the night, but it wasn't bothersome really. Like I noted above, I used this awesome R2D2 tutorial on Instructables. We followed her tutorial for the general idea of basically making a tube dress with straps and adding the R2 hardware by gluing on cut out foam pieces, but instead of using poster board, I sewed a tube dress out of the white pleather (that's always on super sale around Halloween!!). I loved her outfit, but she couldn't sit in it I'm sure! And what if it rained?! So I went with a more all-weather, more comfortable option. Cut a rectangle out of the white pleather after taking measurements. 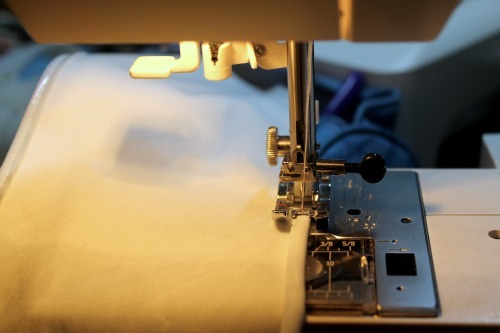 Take measurements: Find the widest part of the person that will wear the costume (around the chest or the hips) and take that measurement and add on 5-7 inches-this will be the width of your rectangle. Adding on the extra inches will allow for wiggle room and give you the ability to sit down. Then measure how long you want it to be. Start at where the top of the "dress" would hit and measure to a few inches above the knee. 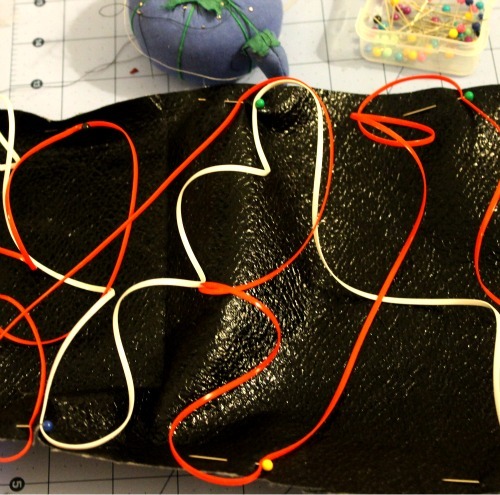 Add about 2 inches to both length and width measurements for seam allowance. Matt is about 6'3" and usually wears a size large. I cut a 51x31 piece of pleather. 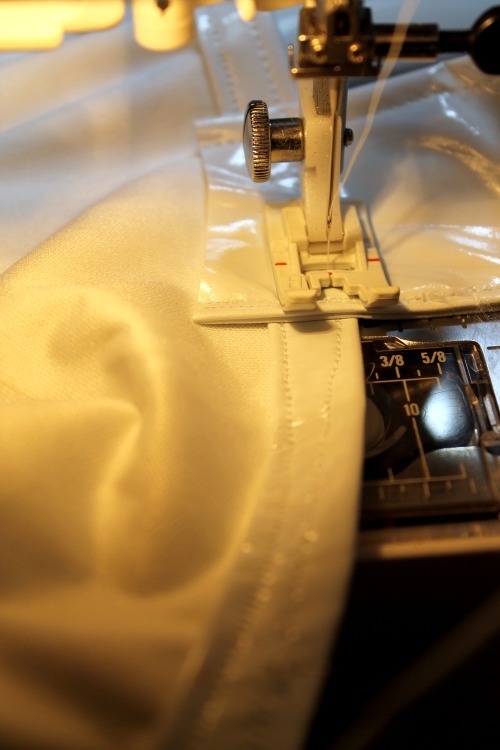 Hem top and bottom of rectangle and sew right sides together to get the tube dress. Cut 2 strips 4 inches wide. The length should be the measurements from the top of the tube "dress" in the front, over the shoulder, and to the top of the tube "dress" in the back. I don't even know what the actual measurement was for this one. I simply made matt put the "dress" on and pinned where each strap should hit in the front and back and used that as my measurements. Fold each side of the strip over about 1/4 an inch and sew down. Then fold the strip over so that wrong sides are facing each other (and iron if you're being precise, or don't like me :) ) and sew along the seams you made already along the edge. Top stitch along the other side. Sew the straps to the front and back of the "dress" along the seams already made when hemming the "dress". The tube "dress" is done! Now you just have to cut out the foam to look like the hardware on R2's body. I have to admit Matt did this part because we made these the night before our party and I was running out of time. He did such a great job. 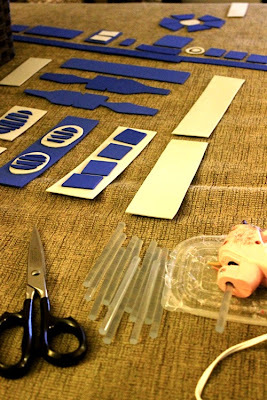 Lay the pieces out on the tube "dress" and then hot glue each piece on. Do the same with the painted helmet. Let's just make it very clear that I did NOT know what I was doing while making this costume. I definitely figured it out as I went. I tried about a million options and found this option on accident and I think it worked better than any of my other ideas. I made the shorts and the top by creating my own patterns. If you already have patterns for shorts and a top, use them, but if you have to create your own, isn't as scary as it seems. I used this post on Shwin and Shwin about drafting your own pattern. 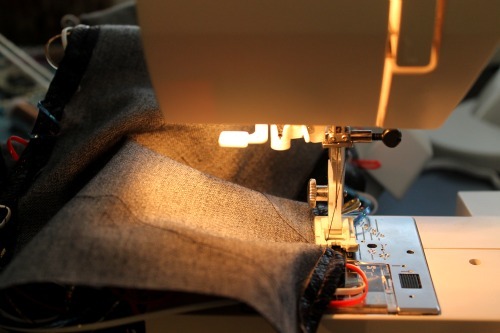 Draft your pattern for the shorts from the well-fitting pair of shorts you have. I did not hem the bottoms of my shorts because the material I was using wouldn't fray very much. For the top, I used a t-shirt to draft my pattern, but I made a few changes to it. I made it a little larger (on accident, but I'm glad I did and you should do it on purpose). Maybe add 2 inches onto the edge of your pattern (not on the fold part) depending on how large the shirt you're using to make your pattern is already. Make sure the head hole is big enough to go over your head!! Unless you want to put a zipper or buttons down the top of the back of your shirt. Also be sure it is a little longer than a normal t-shirt (more like a tunic) to cover the top of the shorts fully. When tracing the shoulder part of the t-shirt on your pattern, curve the shoulder down and made it about an inch longer than it was supposed to be. This created the tunic type shoulder that came out past my shoulder. I did not make sleeves since the shoulder came out like that. See above picture for curved shoulder. I didn't hem anything except the front neckline and the top of the back of the shirt I sewed hot glued gold trim around the sleeves and the neckline (hot glue because I ran out of time and did it right before the party and did not have a sewing machine with me) so a hem wasn't necessary and the belt covered the bottom edge of the shirt so a hem wasn't completely necessary there either. 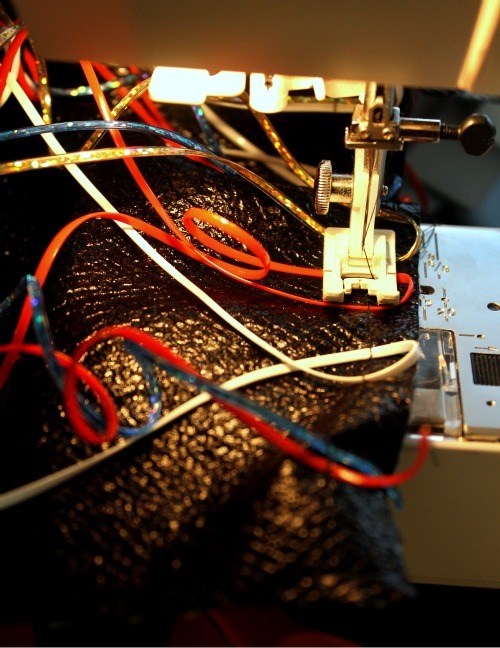 If you're into precision or making sure your costume lasts longer, you might want to hem everything. For the cinched waist, I sewed elastic to the inside of the top. Measure your natural waist and add an inch. 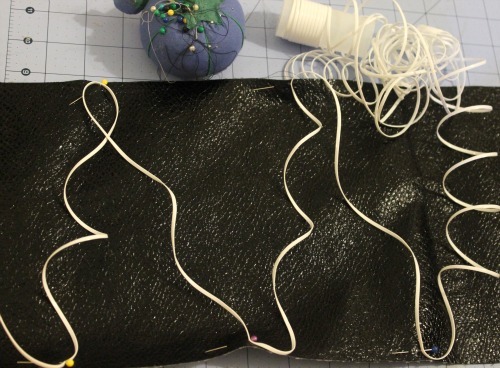 Cut a piece of 1/2 inch wide elastic to fit around your waist, then sew the ends together, creating a circle. 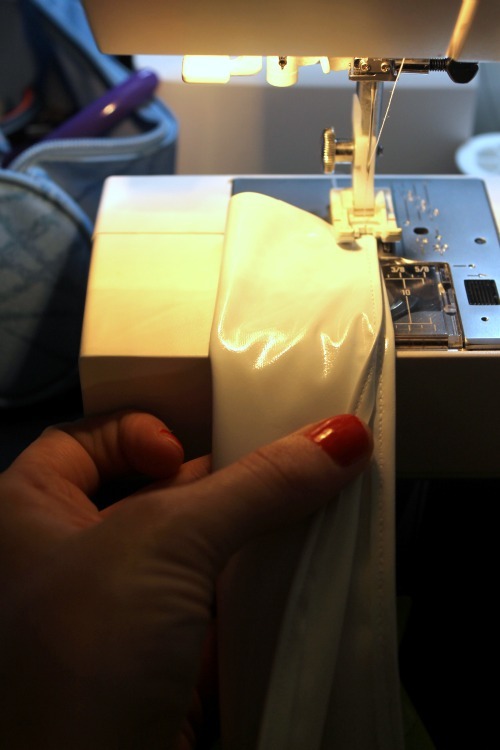 Pin it to your top in 4 places and stretch the elastic as you sew so that it lays flat against the fabric from one pin to the other. For a detailed picture tutorial on this method check out this tutorial: Cinched Tunic Tutorial at Sweet Verbena. 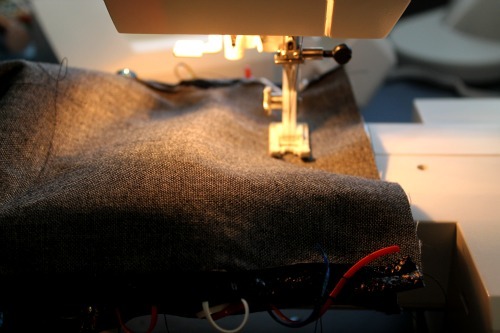 Cut a rectangle 6 inches wide and the same length around the bottom of your top is plus 1 inch for seam allowance. Then pin on the plastic lacing in a zig zag pattern. Let the lacing curl naturally as you go as pictured above. 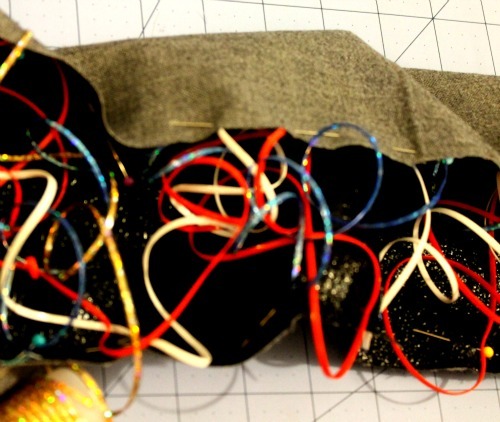 Keep pinning on one color at a time. I used red, blue, white, and gold lacing. The more you pin the more the belt will curl. The lacing may come unpinned. Don't panic- this is not a meticulous process. Just pin it back where you think it goes and move on. 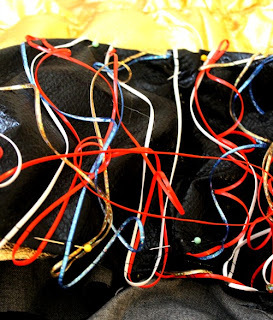 Remove pins as you sew down the lacing. As you can see above, the lacing creates a loop that you sew over. Sometimes my machine still did not like sewing through the plastic even if it was laying super flat, so I would put the presser foot up and turn the wheel a couple times to get the needle to go over the plastic. 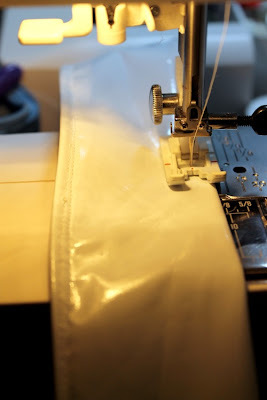 Fold the side over 1/4 an inch and sew down once. Don't worry about the loops of lacing coming out. You can't control C3PO's loose wires. :) It'll look fine once it's sewed to the top. Do this on both sides of the belt. Pin the belt to the bottom of the top and sew along the hem and along the the top of the belt. Glue on the gold trim. 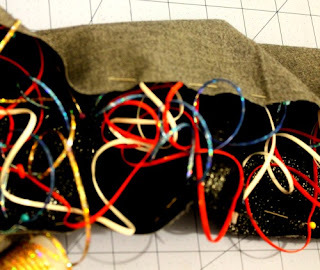 Finally, for the circles, simply place some pins in a circle with about an 8 inch diameter right above the belt. 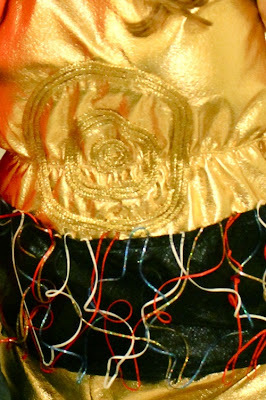 I used a large spool of twine as my pattern and placed pins around it and then glued down the gold trim and removed pins as I glued. For each circle, I used 3 circles of trim side by side (but this depends on the width of your trim). For the second and third circles inside the largest circle, use the largest circle as a guide and created a new circle inside it. For the smallest circle in the center, glue the trim in a spiral until it meets the middle (mine ended up being about 3 circles of trim side by side) and fold the end of the trim under itself and glue it down. I hope you enjoyed the tutorial(s)! 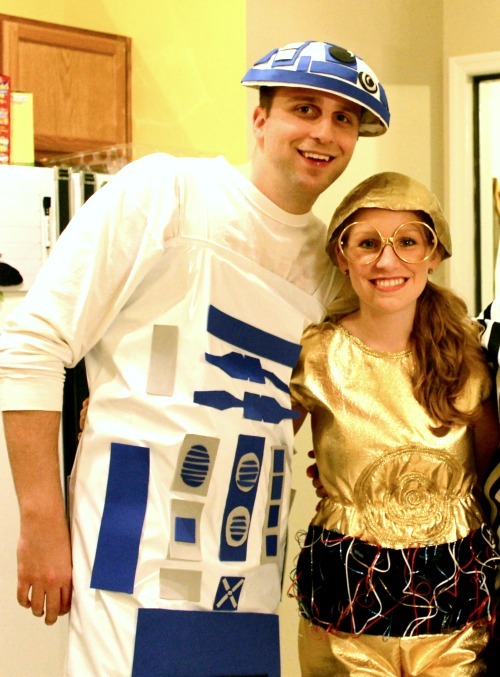 If you want to see more of these droids in action at our Halloween party along with some other fun guests and Halloween decor, go to this post. Please let me know if you make either one of these! I'd love to see it!! I love the costumes! You did a great job! 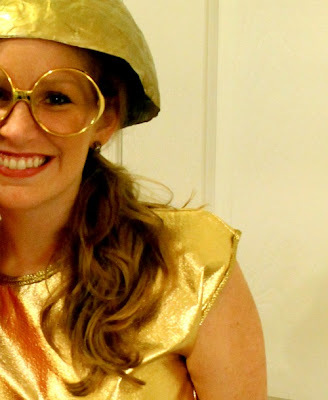 Love your costumes. Would love for you to stop by DIY Home Sweet Home and link up to More the Merrier Monday. Gotta be honest here, ain't no way I'll ever be able to recreate this goodness, but I can tell genius when I see it. Just letting you know I appreciate your nerdiness, some immense WHOW going on here!